So that $50 NOOK has malware…. If you had wondered if that NOOK $50 tablet was too good to be true, turns out you were right. Remember last month’s story on that ADUPS malware that was infecting the Blu R1 HD phones and sending data back to China? Yeah, that one. Well, as it turns out, the same malware is affecting the NOOK BNTV450. 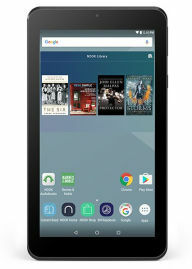 And, unlike the BLU scenario where an update was issued, 9 to 5 Google is reporting that there seems to be no way to disable the ADUPS on the NOOK device. If you want the technical info on the malware, there’s a lot more information on the issue in the Linux Journal article that apparently broke the story. The article notes that Google has blacklisted the ADUPS agent and that a user can expect “zero privacy” from a device with this agent installed. Barnes and Noble has yet to comment on the story. Since I bought one of these last month, I am not a happy camper. Although I hadn’t had time to do much with it (maybe a blessing in disguise), I was already past the 14 day return window that the online store allows. I have performed a factory reset on my device while I reach out to Barnes and Noble on the matter. I suggest you do the same or use at your own risk. While the ADUPS does not seem to be active at the moment, that can change at any time. To reset the device, go to Apps> Settings>Backup and Reset. (Note that the correct one is the grey option that says just settings, not the green NOOK settings option.) Everything will be erased from the tablet, so make sure to transfer any files you want to keep. This entry was posted in Nook and tagged ADUPS, Barnes and Noble, malware, tablet. Bookmark the permalink. Did you know that you have until 31 January to return it? Nate, THANKS! I did not see that – the receipt said 14 days so I thought I was sunk. I sure am not going to want to keep the tablet at this point. Hopefully, customer service won’t give me a hard time. TY again!